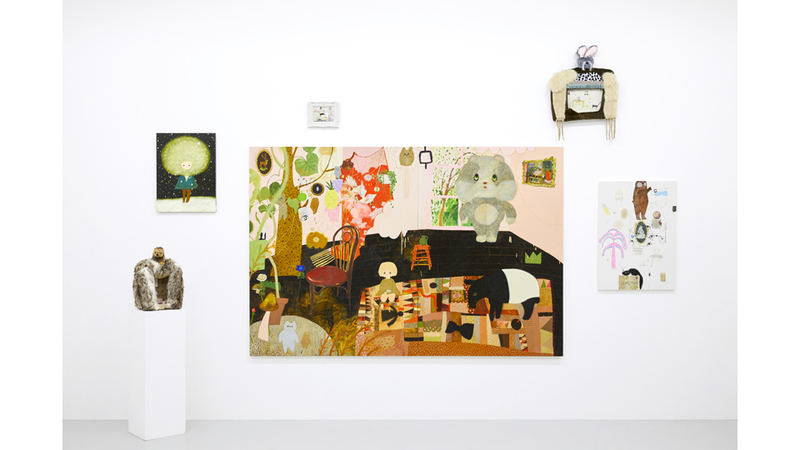 In Tomoko Nagai’s works, various motifs such as animals, young girls, colorful trees and mushrooms are scattered against backgrounds of forests or rooms that appear reminiscent of theater sets. All of her works harbor a unique spatiality in which a sense of liveliness as if having condensed the world of fantasy, complexly overlap with the layers of the image. Nagai employs various media such as a sculpture and installation as well as a painting within her practice. This results in diverse matiere and levels of intensity that become elements and rhythms　that together constitute a single musical score. In sensing this music, we as viewers unwittingly find ourselves entering the narratives of her work. This exhibition that marks the artist’s fifth time presentation at Tomio Koyama Gallery for the first one in three years, features works created since 2006 as well as　a selection of her latest works. We invite viewers to venture into Nagai’s magical and dreamy world, conjured from her works that have been created in her cherished atelier. The time I have spent in my Atelier is peach and rose colored, and is magic. Matisse’s work “The Pink Studio,” is a work that I very much appreciate. I have worked in several ateliers within the past 12 years and all have been precious places to me. Presented are works that have been created as a culmination of many days, including works I made a long time ago. Of course, there will be a latest works as well. Tomoko Nagai was born in Aichi in 1982, and graduated from Aichi Prefectural University of Fine Arts and Music in 2006. She currently lives and works in Tokyo. She has held a solo exhibition at Project N in Tokyo Opera City Art Gallery in 2008, and in numerous other cities including Kyoto, Kagoshima, Hong Kong and Singapore. A solo exhibition of her works was held at Roppongi Hills A/D Gallery in Tokyo in 2017. She has also participated in “VOCA 2010” at The Ueno Royal Museum, Tokyo, as well as international exhibitions such as “Future Pass – From Asia to the World” a Collateral Event of the 54th International Art Exhibition la Biennale di Venezia (Palazzo Mangilli-Valmarana, Venice, 2011), in addition to other group exhibitions in Seoul, Grenoble, and Berlin. Asides from exhibitions, she has also worked on a project in which she painted the walls of the swimming pool in a Toyama nursery school (designed by Takahashi Ippei Office, 2013) located in Shichigahama town, Miyagi, one of the disaster-stricken areas of the Tohoku earthquake and tsunami. Nagai has also created work for a TV program’s opening title on NHK. Her works are housed in public collections including The Takahashi Collection (Japan), The Olbricht Collection (Germany), The Zabludowicz Collection (UK) and The JAPIGOZZI Collection (US/ Switzerland).